Deep in a single square metre of trench D at Landsjö castle, on the inner edge of the dry moat, we found five identical coins. Boy are they ugly. They’re thin, brittle, made of a heavily debased silver alloy and struck only from one side; they bear no legend and the image at the centre is incomprehensible. 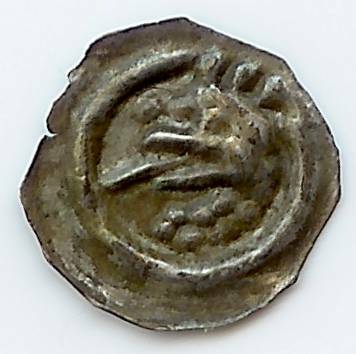 But I love them anyway, because they offer a tight date: this coin type was struck for King Valdemar Birgersson c. 1250-75. And the first written mention of Landsjö dates from 1280, so it all works out. Valdemar became king because he had an extremely powerful and ruthless father, the jarl Birger Magnusson. Being a jarl meant either acting as viceroy over an area or as the king’s right-hand man in general. King Erik the Lisp and Lame was Jarl Birger’s brother-in-law. When Erik died childless in 1250, his nephew Valdemar, the jarl’s son, was elected king though still a child. Jarl Birger then ruled in his son’s place until dying in 1266. Valdemar ruled on his own for nine more years before being deposed by his more effective younger brother Magnus. King Valdemar is mainly remembered for his dalliances with various women rather than for any political achievements. So what are these ugly coins supposed to depict? Well, many dies were in use, partly because there were many mints – of which only the one at Lödöse in Västergötland has been securely identified so far. 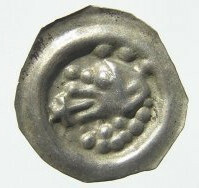 And some of the dies were much more detailed than the one used for our five coins. 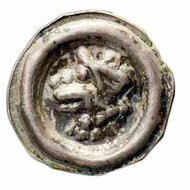 The most detailed ones clearly depict the crowned head of a carnivore, most likely a lion. And Valdemar’s father’s coat of arms showed a bare-headed lion. So the crowned lion refers to Valdemar himself, or more generally to the crowning of Jarl Birger’s lineage. The dynasty kept the Swedish crown for over a century. I would like to raise the issue of “provenience” vs. “provenance.” At least in my experience archaeologist use the term provenience and art historians and collectors use provenance. Some say they are interchangeable, but at least in North American archaeology they are usually distinct, at least in my opinion.. Even in your language, Martin has used the term correctly here – where he has used the word, he’s talking about provenance, not ‘provenience’. Awesome some poor soul must have lost his purse for you to find three quarters of a millennium later with just the coins you’re looking for. Would give me goosebumps. Often you hire locals to do it. People can become accustomed to heat (or cold, for that mater) if they are continually exposed to it. I have personal experience in that regard: When I lived in Miami (typical July temperatures are 35-37C in the afternoon and 25-28C for overnight lows), I could deal with hot, humid weather, but not cold (the coldest temperature ever recorded at KMIA is -2C; it can be a few degrees colder further inland, but most people live near the coast). Now that I live much further north, cold doesn’t bother me so much (not until it gets below about -15C; we sometimes see -20C, but not every winter, and not much colder than that), but I can’t deal well with temperatures above 30C, especially when it’s humid. And that’s just the stuff they know about so far. Eric is right – you acclimatise. “The ambient temperature is 45 C and the relative humidity 98%” – this must be close to the limit of human endurance. After all, we can only cool off by sweating. That only works of the air is unsaturated with water vapor. Yes, in those conditions, your body’s cooling system is barely functioning. I’ve got one mate who was doing the blasting for a tunnel last year. Tunnels under construction are almost always wet, because groundwater comes in through the joints in the rock, and this tunnel was very wet and very hot – he had to walk for 45 minutes from the portal to the face, then load and connect up the shot, then walk 45 minutes back to the portal again before he could fire the shot. This guy is 60 years old and his body has had a fair battering, both self-administered and otherwise (his hobby used to be riding wild bulls in rodeos), and he reckons by the time he was ready to fire the shot, he was just about all-in. The ‘parks’ here are all natural terrain at an average of about 35 degrees to the horizontal, except at the coastlines where there has been wave-undercutting, so it’s steeper, and covered in really dense vegetation. Families go out for a nice walk in the park in the middle of summer, forget to take any water with them, of course, and literally drop dead from heat stroke before an emergency services helicopter can get to them. I used to drill tennis ground strokes with my old coach non-stop for 3 hours in the middle of the day in summer, which is a lot harder physically than just playing a match, drinking plenty of fluids and taking electrolytes, obviously – in one week of doing that I lost 11 kilograms. I have had doubles partners literally black out on me on the court in the middle of a tennis match. Tip – I’m not a huge fan of Coca Cola normally, but if you are playing in those conditions and start feeling nauseous and dizzy, like you are going to pass out, sit down in the shade and drink a ice-cold can of Coca Cola, and in 10 minutes you will be able to get back on your feet and playing again. Tip 2 – after drilling ground strokes for 3 hours every day for a week in the sweltering heat and humidity, I finally became fully acclimatised to a hot humid climate. I was adapted to dry heat, due to where I grew up, but had always found very high humidity hard to cope with, but after that week, it was no longer a problem for me, and has not been ever since. It still doesn’t make any difference to your body’s evaporative cooling system, though, in that very little sweat can evaporate into dead still, almost saturated air. It means you need to keep your cool fluid intake up, and be very sensitive to whether your body is over-heating, because heat stroke can hit you really fast without much warning, and can easily be fatal. I don’t want to gross anyone out, but when I am doing tennis training in summer, I need to change my T-shirt every 30 minutes because it is completely saturated with sweat. Doing all that laundry can be a bit tiresome. The other thing to watch out for, with sweating that much, is electrolyte depletion – it can make you go temporarily deaf. A lot of long distance runners get that. And also crippling muscle cramps, obviously. Or try a bit of Kunqu? Just a suggestion, mind – it’s not everyone’s cup of tea. Now compare to Fujian Opera – I am sure you will agree the bikinis would be a welcome improvement. And this one’s heading for the SPAM filter big time.